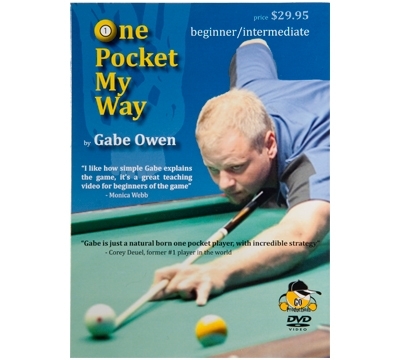 Gabe Owen is a US Open 9-ball champion better known for his one pocket knowledge and skills. He's won several one pocket titles including the 2008 Derby City Classic One Pocket Championship, the 2008 Players Championship One Pocket division, and the 2004 Midwest Expo One Pocket Championship. Gabe was considered a phenom one pocket player at the age of 18. Now he wants to share his secrets with you! This great DVD covers covers all the basics you need to learn how to play this great game. In this series Gabe goes over the break, break returns, banking and kicking systems as well as ball count strategy.